Washington Post~The Tea Party is nothing new. It represents a relatively small minority of Americans on the right end of politics, and it will not determine the outcome of the 2010 elections. In fact, both major parties stand to lose if they accept the laughable notion that this media-created protest movement is the voice of true populism. Democrats will spend their time chasing votes they will never win. Republicans will turn their party into an angry and narrow redoubt with no hope of building a durable majority. Their findings suggest that the Tea Party is essentially the reappearance of an old anti-government far right that has always been with us and accounts for about one-fifth of the country. The Times reported that Tea Party supporters “tend to be Republican, white, male, married and older than 45.” They are also more affluent and better educated than Americans as a whole. This is the populism of the privileged. Saying this invites immediate denunciations from defenders of those who bring guns to rallies, threaten violence to “take our country back,” and mouth old slogans about states’ rights and the Confederacy. So let’s be clear: Opposition to the president is driven by many factors that have nothing to do with race. But race is definitely part of what’s going on. The poll asked: “In recent years, do you think too much has been made of the problems facing black people, too little has been made, or is it about right?” Twenty-eight percent of all Americans — and just 19 percent of those who are not Tea Party loyalists — answered “too much.” But among Tea Party supporters, the figure is 52 percent, almost three times the proportion of the rest of the country. A quarter of Tea Partiers say that the Obama administration’s policies favor blacks over whites, compared with only 11 percent in the country as a whole. So race is part of this picture, as is a tendency of Tea Party enthusiasts to side with the better-off against the poor. This puts them at odds with most Americans. The poll found that while only 38 percent of all Americans said that “providing government benefits to poor people encourages them to remain poor,” 73 percent of Tea Party partisans believed this. Among all Americans, 50 percent agreed that “the federal government should spend money to create jobs, even if it means increasing the budget deficit.” Only 17 percent of Tea Party supporters took this view. Asked about raising taxes on households making more than $250,000 a year to provide health care for the uninsured, 54 percent of Americans favored doing so vs. only 17 percent of Tea Party backers. This must be the first “populist” movement driven by a television network: Sixty-three percent of the Tea Party folks say they most watch Fox News “for information about politics and current events,” compared with 23 percent of the country as a whole. The right-wing fifth of America deserves news coverage like everyone else, and Fox is perfectly free to pander to its viewers. What makes no sense is allowing a sliver of opinion to dominate the media and distort our political discourse. A correspondent for New Left Media ventured out among the tea partiers during their tax day protests in Washington D.C. last week to interview them about what it is that’s fueling their fierce opposition to to the government in general and President Obama in particular. Suffice to say, the answers involve lots of wild-eyed claims about tyranny and socialism. Highlights include a woman gravely warning “Obama is considering banning fishing in America,” as well as another dressed in a ball and chain outfit to illustrate how our liberties are being constrained. The tea party movement has gotten much attention in recent months, but aside from decrying big government and excessive spending, who are the supporters and what else do they appear to believe? Many believed that the election of Barack Obama brought to a close the long, painful, and ugly history of race and racism in the United States. But as the incident with Henry Louis Gates last summer, and the more recent shenanigans with Tea Party activists suggest, racial divisions remain. Which is closer to the truth? A recent survey directed by University of Washington political scientist, Christopher Parker, finds that America is definitely not beyond race. For instance, the Tea Party, the incipient movement that claims to be committed to reigning in what they perceive as big government, appears to be motivated by more than partisanship and ideology. Approximately 45 % whites either strongly or somewhat approve of the movement. Of those, only 35% believe blacks to be hardworking, only 45 % believe blacks are intelligent, and only 41% think that blacks are trustworthy. Perceptions of Latinos aren’t much different. While 50% of white tea party supporters believe Latinos to be hardworking, only 39% think them intelligent, and at 37%, fewer tea party supporters believe Latinos to be trustworthy. The survey shows among whites, southerners are 12 percent more likely to support the tea party than whites in other parts of the U.S., and that conservatives are 28 percent more likely than liberals to support the group. 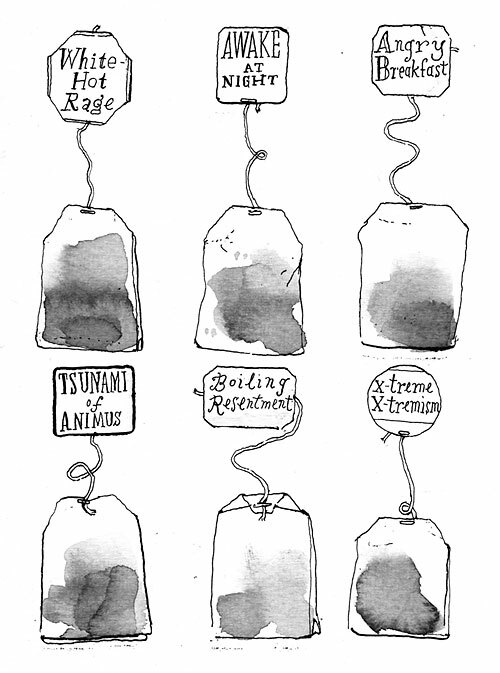 “The tea party is not just about politics and size of government. The data suggests it may also be about race,”said Christopher Parker, a UW assistant professor of political science who directed the survey. Indeed, strong support for the tea party movement results in a 45 percent decline in support for health care reform compared with those who oppose the tea party. “While it’s clear that the tea party in one sense is about limited government, it’s also clear from the data that people who want limited government don’t want certain services for certain kinds of people. Those services include health care,”Parker said. Parker directed the 2010 Multi-State Survey of Race and Politics, a broad look at race relations and politics in contemporary America. The survey reached 1,015 residents of Nevada, Michigan, Missouri, Ohio, North Carolina, Georgia and California. All were battleground states in the 2008 presidential election with the exception of California, which was included in the survey to represent the West Coast. The survey found that 30 percent of respondents had never heard of the tea party, but among those who had, 32 percent strongly approved of it. In that group, 56 percent of Republicans strongly approved, 31 percent of independents strongly approved and 5 percent of Democrats strongly approved. Preliminary analysis also reveals race affects the ways in which blacks and whites perceive the president, his policies, and how he’s handling his job. To illustrate, 75% of blacks have confidence in the president; 58% of whites share this appraisal. Likewise, where 90% of blacks think the president is doing a good job on the economy, 55% of whites agree with this appraisal. And the most recent hot-button issue, health care reform, received support from 86% of blacks versus only 36% among whites. “Are we in a post-racial society? Our survey indicates a resounding no,”Parker said. Conducted by telephone from Feb. 8 to March 15, the survey reached 494 whites, 380 blacks, 77 Latinos and 64 members of other races. The sampling error margin is plus or minus 3.1 percentage points. The Washington Institute for the Study of Ethnicity, Race and Sexuality and the UW Department of Political Science paid for the survey. It was conducted by the UW’s Center for Survey Research. AP~President Barack Obama says he believes the Tea Party is built around a “core group” of people who question whether he is a U.S. citizen and believe he is a socialist. But beyond that, Obama tells NBC he recognizes the movement involves “folks who have legitimate concerns” about the national debt and whether the government is taking on too many difficult issues simultaneously. ThinkProgress/Lee Fang~Yesterday, House Minority Whip Eric Cantor (R-VA) falsely charged that his office was “directly threatened” in a gun attack. Cantor used the incident to provide partisan cover to his unruly GOP colleagues, who have been pandering to tea party activists with increasingly unhinged and extreme rhetoric. Last weekend, as the House vote on health reform legislation neared, Republican lawmakers whipped tea party crowds into an angry mob. For instance, Rep. Ted Poe (R-TX) spoke to the crowd with a megaphone, conjuring up debunked conspiracy theories about government spying into medical records and decrying what he called “tyranny.” Rep. Steve King (R-IA) held up a picture of Speaker Nancy Pelosi (D-CA) for the crowd, mocking it and “slapping” it. Throughout the day, the tea party protesters accosted Democratic members of Congress with racial and homophobic slurs, and one protester even spat on Rep. Emanuel Cleaver (D-MO). ThinkProgress/Faiz Shakir~After picking up his 10-year old daughter from school yesterday afternoon, Nashville resident Mark Duren was driving home when he was suddenly and intentionally rammed from behind by Harry Weisiger. Enraged at the sight of Duren’s Obama bumper sticker, Weisiger gave Duren “the bird” and then hit him from behind, leading to a violent series of events. 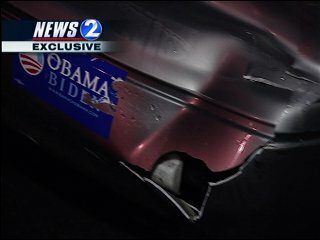 According to WKRN, the man accused in an incident of road rage over an Obama bumper sticker Thursday afternoon says he was only trying to get around another car that had stopped in front of him. Weisiger did not mention the Obama bumper sticker when News 2 spoke with him on the phone Friday, but did admit fault for leaving the scene of the accident. According to the police report, officers found Weisiger in the parking lot of Harris Teeter, where he said he had stopped to buy dinner. David Todd, who witnessed the accident, said the SUV hit the car more than once. Weisiger is charged with two counts of reckless endangerment, driving under the influence, refusing to take a breath test, and leaving the scene of an accident.